Fresh US diplomatic cables released via Wikileaks suggest governments have pressed the US Drug Enforcement Administration (DEA) to extend wiretapping services. Publishing the secret cables, the New York Times said governments wanted information on political adversaries. Panama and Paraguay are two of the nations cited. 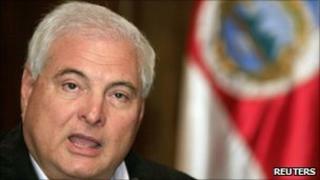 Panama's government says President Ricardo Martinelli's request on wiretaps had been "misinterpreted" by the US envoy. In a cable from August 2009, President Martinelli is reported to have "sent the ambassador a cryptic Blackberry message that said: 'I need help with tapping phones'". Then US ambassador to Panama, Barbara Stephenson, says: "He made reference to various groups and individuals whom he believes should be wiretapped, and he clearly made no distinction between legitimate security targets and political enemies." The Panamanian president's office has issued a statement saying the government "regrets the misunderstanding by the US authorities. The request for assistance was made for the struggle against crime, drug trafficking and organised crime". "We never asked for help to tap telephones of politicians. Any interpretation to such a request is completely wrong," it says. In a cable from February 2010, the DEA tries to resist a request by the government in Asuncion to spy on the Paraguayan People's Army insurgent group, accused of a number of kidnappings. The New York Times says that when US diplomats baulked, Paraguay Interior Minister Rafael Filizzola threatened to shut down DEA operations in Paraguay. Diplomats finally agreed to allow wiretapping for anti-kidnapping work under certain circumstances. "We have carefully navigated this very sensitive and politically sticky situation. It appears that we have no other viable choice," a cable says. The Times says the DEA has 87 offices in 63 countries and that many governments are eager to take advantage of the advanced wiretapping technology the agency uses. DEA spokesman Lawrence Payne said on Saturday it could not comment as the cables were considered classified. In another cable from October 2009, Mexican Defence Secretary Gen Guillermo Galvan is quoted as saying he does not trust other Mexican law enforcement agencies in anti-drugs work because of leaks and corruption. A number of cables reveal the extent of the involvement of senior officials in the drug trade in some countries. In one cable dated March 2008, US diplomats in Guinea report that a supposed incineration of drugs was faked. The cable says: "The event was a real eye-opener and a facade. The incineration was a ridiculous attempt by the [government of Guinea] to prove that a law enforcement campaign against narcotics exists. If anything was proven, it was that the traffickers' influence has reached the highest levels of the government." The Wikileaks website - together with several major media organisations - is currently publishing tens of thousands of leaked US diplomatic cables.